Crafted with a selection of Game, Liver, Beef in a savoury sauce. 100% complete and balanced nutritional pet food for adult cats (aged 1 to 7). A tempting variety of flavours to tempt your cat's taste buds. Served in 50g pouches to keep every meal fresh and convenient. Packed with essential vitamins and minerals to keep your adult cat healthy. No added artificial colourants, flavourings, preservatives.You know your cat prefers to eat small meals several times throughout the day. 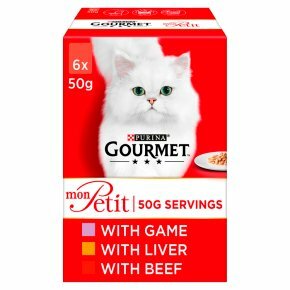 This is why GOURMET has created Mon Petit, a range of exquisite recipes specially developed in small portions for your cat to enjoy. Fine cuts with beef, chicken, salmon and other exquisite flavours, in a delicious sauce for an excellent meal. Thanks to the small 50g pouch, you can serve your cat a fresh meal with a different flavour each time, that he can eat all at once. This means more enjoyment and variety for him, and no leftovers for you. All recipes have no added artificial colourants, preservatives and flavourings. GOURMET Mon Petit: a variety of delectable meals that are just the right size. Feeding instructions: For an average adult cat (4kg), serve 6 to 7 pouches throughout the day in at least 2 separate meals. The adult maintenance averages are based on moderately active cats at normal environmental temperatures. Individual needs vary and feeding should be adjusted as required to maintain your cat at a lean, healthy body weigh. Fresh, clean drinking water should always be available.